Beautiful Incentives: Dorm co Rolling Polyester Pop up Hamper review. Plus Giveaway! Dorm co Rolling Polyester Pop up Hamper review. Plus Giveaway! As mentioned a million times before, I have back issues. Bad ones. When I can find anything that will help make things easier on my back, I rejoice! This is why Dormco has become one of my favorite sites. Not only for their cheap prices, but also for the nifty things they offer that happen to be oh so convenient, like this collapsible hamper I received for review. This has been amazing to have. My back thanks dorm co. 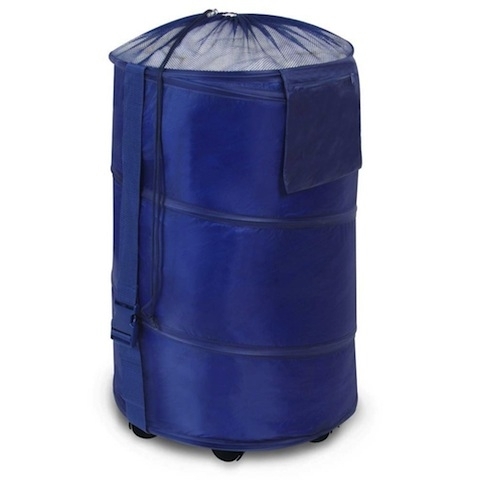 It is a laundry hamper in a pretty deep blue color that collapses when not in use, but easily pops up when needed. It has wheels, which is the main godsend. I no longer have to lug the heavier loads of laundry. I just throw it all in this large hamper and pull it to the laundry area. No lifting needed. Now If I could only buy magical powers to take the clothing out so I don't have to bend. At least half the feat is over! It is much larger than my other wicker hamper in the picture below, and 100 X lighter. This is a perfect size for me because I have very little whites and lights and a whole mother load of dark and medium colored clothing. All I have to lift on occasion is my small hamper for the other small loads. 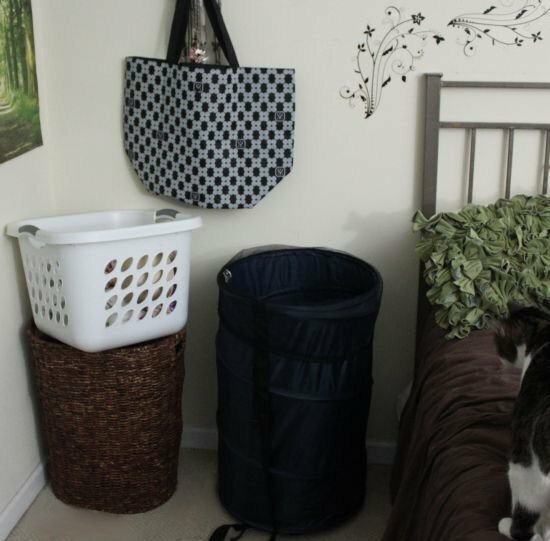 I am very happy with my collapsible laundry hamper and it really isn't an eye sore so adults out of college would find great use from it too. 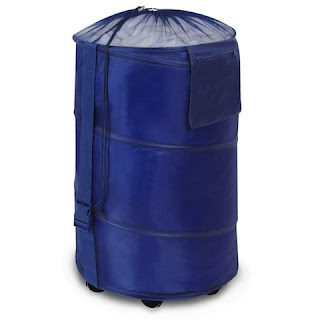 If you are a college student, this will be your best friend when lugging all your dirty laundry to the laundromat, which is usually far away. If you have back problems or just need an easier more convenient way to transfer your dirty laundry to be cleaned, this is the answer! 45" L carry strap for those lighter load days or just to help pull the load. Secure mesh drawstring top to keep clothing in place during transport. There is also a small mesh pocket to put light things in, like a stain stick. Collapses by just pushing down and securing with strap. Dorm co. may be geared toward college students, but anyone and everyone will find something to fit their lifestyle. Seriously, they have everything you could ever need for organization. Such as this beautiful Sorority trunk I reviewed last yr.
Plus, shipping is always ONLY $2.95, with NO minimum purchase! 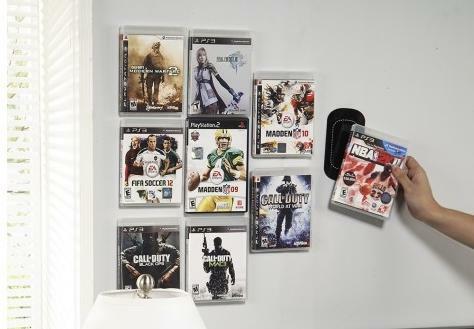 Dorm co offers a tremendous amount of awesome accessories with the latest inventive products, like this wall sticky holder for just $6.99, how nifty! There are so many things I need to get! If you'd like to purchase now, learn more and keep up with their promotions, follow them on their social media sites. Disclaimer: Product was provided to me for the purpose of facilitating a review with my honest opinions. I was not compensated monetarily or in any other form. This blog is not responsible for fulfillment of prize. Dormco has been kind enough to offer the same hamper I reviewed to one lucky Winner. A perfect back to school necessity! Good Luck! At home. I don't know how two people come up with the amount of laundry that we do but we're always running out of space. I would love to win one for the kids room! I would use this at home. I will be using this at home. I would use this at home it would be useful especially since we will be moving to a condo community with laundry facilities in a separate building. at home in my kids room! At home. Would be great for my kids room. I will be using this at home! My husband and I could really use this! I will be using this at home because I can't keep up with the laundry. I'd use it at home!